Get the Best VPN to Stream ESPN3 Live From Anywhere! You can access ESPN3 Online with PureVPN's Chrome & Firefox extension from anywhere. How to Access ESPN3 Live from Anywhere? PureVPN gives you unrestricted access to a huge IP reserve, so you can easily access your favorite streaming channel ESPN3 from anywhere as if you were in the US. Plus, your online identity is secured with 256-bit encryption. Often called the College Cup, this tournament is the most famous soccer championship that takes place annually. This year, NCCA will host its 60th championship, where 206 teams will participate. Also known as college football, NCAA is an annual championship that’s played between teams and players from different universities across the US. The NCAA has been going on from more than a hundred years, and is loved by all Americans. Don’t miss a second of your favorite team playing due to lag or slow internet speeds. Get around restrictions and view your favorite matches from any location on the planet. Use the internet freely and without any restrictions that might spoil your experience. If you’re not satisfied with PureVPN, you can get a refund within 31 days of your purchase. PureVPN never caps your bandwidth. Go ahead and steam as much as you like! Gone are the days when ISPs could slow down your internet speed just because you are a streamer. Does PureVPN come with an ESPN3 account? No. PureVPN does not come with an ESPN3 account. You have to subscribe for ESPN3 separately. How can I watch ESPN3 live stream? 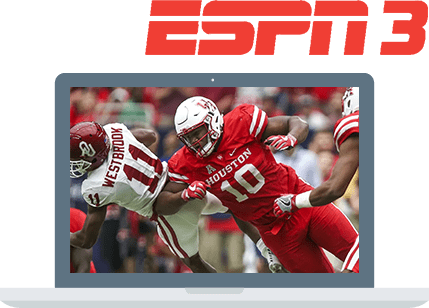 Customers with TV providers that are not listed can gain access to ESPN3 programming online at WatchESPN.com, as long as they subscribe to a participating internet service provider (ISP). Do I need to have an account from my TV service provider to access ESPN3? If you are not currently signed up with a TV service provider, you will need to do so in order to watch ESPN3 online. You can also watch ESPN3 if you have subscribed to a participating ISP. Can I stream ESPN3 while travelling? Yes! You can watch ESPN3 while you are traveling. Say, you are going to Italy or England for vacation, you will be able to access ESPN3 once you connect to PureVPN. Can I get ESPN3 live stream free? We all love free things, but sadly nothing in life is free. You will have to subscribe for the VPN service through the order page. I can’t access ESPN3. What should I do? To resume watching ESPN3, check if you are getting an error code or message on-screen. If not, you are advised to contact our 24/7 live chat support team for further assistance. Why Do You Need A VPN For ESPN3? A VPN makes your ESPN3 streaming experience much better by making you completely anonymous online. With a VPN, you can easily avoid ISP and third-party monitoring. Being completely anonymous online makes it impossible for ISPs to detect your online activity and limit it. Your bandwidth will not get compromised when you stream ESPN3 with a VPN. ESPN3 is an online streaming service that provides access to live streams for sports matches taking place around the world. It allows its viewers stay updated with everything that's going on in their favorite sports. How to watch ESPN3 on TV? If you live in the US, and take TV cable services from any of the reputed cable providers such as Time Warner Cable, Bright House Network, or Verizon FiOS, you will ESPN3 on your TV set by default. However, if you are not in the US, you will need a VPN to change your virtual location to the US so that you can evade regional limitations and access ESPN3 live streams. Where can I watch ESPN3? You can watch ESPN on your TV if you live within the US. If not that, you can access the ESPN3 website and get hold of the live stream from there. However, if you live outside the US, you will not be able to access any live streams due to regional restrictions that blocks ESPN3 in your region. To avoid this issue, you will need a good streaming VPN to change your virtual location to US so that you can access ESPN3 easily. A wide range of sports is covered on all ESPN channels including ESPN3. Some of these include college football, college basketball, NCAA Championships, tennis, golf, soccer, and cricket. How can I watch ESPN3 without cable? To access ESPN3 without cable, you will need to subscribe to a monthly streaming service which can offer you ESPN3 live content. There are many services at varying prices out there, some of which include Hulu, YouTube TV, PlayStation Vue, DirecTV, and Sling TV. While each of the service offers diverse and unique content, it totally depends on your need to decide which service will be better for you. However, all of them offer ESPN3It is worth noting that most of these services only work in the US. If you want to make use of these services outside the US, get PureVPN and change your virtual location to US. What shows can I watch on ESPN3? The most famous show on ESPN3 that everyone wants to watch is called Tennis on ESPN3. It has been ongoing since 1979, and till date continues to provide tennis fans with updates and speculations related to everything that’s ongoing on the global tennis calendar.Apart from that, another sports show, which is quite popular among ESPN3 viewers is NBA on ESPN3. Not as old as Tennis on ESPN3, NBA on ESPN3 has been around since 1982, and has kept basketball fans’ enthusiasm up since then.